Abstract: In recounting the history of Cherbourg as an Aboriginal settlement, the Ration Shed Museum presents some traumatic narratives. It paints a picture of violent geographic and cultural dislocation, crude living conditions, forced labour and administrative oppression by infusing historical artefacts with the personal recollections of Cherbourg residents. The intent behind the Ration Shed Museum itself, however, is something quite different: its curators want to tell a story that speaks of hope for this community’s future, and to work towards some form of reconciliation. They do this by actively engaging with the ‘terrible gift’ of the past in the present, and by providing spaces for encounters that can lead to open discussions of difficult social issues and celebrations of contemporary Cherbourg life. This article draws on ethnographic interviews and observational data alongside the theoretical work of Roger I. Simon and Andrea Witcomb to describe how the Ration Shed Museum engages its community and visitors in a dual process of both understanding Cherbourg’s history and reframing traumatic narratives to enact a pedagogy of hope. Abstract: The Great Shearers’ Strike of 1891 transformed Australian politics and created the context for the election of the first ‘labourist’ government in the world. This nationally significant history is reflected in Barcaldine’s central heritage precinct, with a large monument to the Tree of Knowledge and spacious Australian Workers Heritage Centre. The Centre was established as the ‘National Monument’ to working men and women when it was opened by Prime Minister Bob Hawke in 1991. The Centre is one of a number of industrial museums in the Central West, and exists alongside the Stockman’s Hall of Fame in nearby Longreach. The recent increase in tourism by Grey Nomads has resulted in a more concerted effort to formulate a clear heritage discourse in Barcaldine, one that draws on the town’s labour heritage. This increased emphasis on the heritage of the Great Shearers’ Strike has further politicised an already fraught heritage, and distanced the community from its local heritage spaces and stories. This article reflects on long-standing narratives relating to the local environment as a means to articulate contested heritage discourses, situate the significant labour history and reinforce the local community’s engagement in its heritage. Abstract: A serene little walking track graces the hillside along Mons Road between Buderim and the Bruce Highway. It marks a significant piece of state heritage: the Buderim–Palmwoods Tramway. Behind it lies a story of community driving discovery, emergence, conservation and use. This article tells of the emergence of the walking track using Deleuze and Guattari’s assemblage concept to explore the ‘becoming’ of the walking track. Assemblages provide an understanding of heritage as a process rather than a fixed entity, examining the re-territorialisation of the tramway track and the ways in which its boundaries are constantly challenged by human and non-human elements. The continuums of territorialisation/deterritorialisation and materiality/expression offer insights into heritage management. Analysis of the tramway as a heritage assemblage reveals the ongoing process of caring for heritage: it shows the strengths of clear boundaries, and permeable ones, and the importance of both material and expressive roles of the components comprising a heritage place. An assemblage view moves conservation beyond the fabric, the architectural and aesthetic to the interplay of the atmospheric, the emotional and the expressive, recognising the action and agency of heritage components and their ability to affect and be affected. 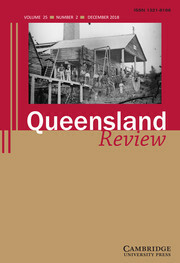 Abstract: This article examines the lived experience and recent commemorative efforts relating to the experience of displaced prsons who were sent to Queensland in the post-war period. 170,000 displaced persons — predominantly Central and Eastern Europeans — arrived in Australia between 1947 and 1952. They were sent to reception and training centres upon their arrival before commencing a two-year indentured labour contract. Memorialisation of these camps tends to present them as the founding places of the migrant experience in Australia; however, there has been very little historical work on displaced persons in Queensland, or on the Queensland migrant camps — Wacol, Enoggera, Stuart and Cairns. This article focuses on recent commemorative attempts surrounding the Stuart migrant camp in order to argue that, in relation to displaced persons, family and community memories drive commemorative activities. Abstract: One response to the development of tourism in small inland Queensland towns has been to collect heritage machinery from the surrounding countryside and display it in town as an attraction for visitors. These sites range from open-air collections of miscellaneous i3tems with no explanation of their use to both private and local government museums that are given varying levels of care and interpretation. The small north-western Queensland town of Croydon has a collection of heritage machinery in a number of sites, which range across this continuum. This article explores the potential of the collection to interpret the town’s history and the history of early gold mining, as a case study with application to other such collections. Abstract: The Queensland Historical Atlas (2010) takes a fresh approach to the atlas form by interpreting Queensland landscapes as lived, embodied and practised. As a project conceived in partnership with Queensland Museum, the Atlas brings this approach directly into museum practice. This article outlines some of the challenges of the conventional atlas form, and examines how the Queensland Historical Atlas has embraced opportunities to reinvigorate the form, including the adoption of new technology and developing new affective interpretation frameworks. Significantly, the Atlas places material culture, including historical maps, at the centre of interpretation of Queensland landscapes. Although the Atlas is not an exhibition, it creates ready-made modules available for exhibition interpretation. Each of these reflects on how Queensland is shaped by its landscapes and how, in turn, museum collections can capture the diverse landscapes of Queensland and the people who create those landscapes. As an electronic resource, the Atlas becomes a way of reconnecting cultural history and landscapes with museum collections. Theatre Project at Old Government House, Brisbane. Abstract: Old Government House (OGH) is one of Queensland’s premier heritage buildings, and is located within the Gardens Point campus of Queensland University of Technology (QUT). This 156-year-old building, now a house museum, offers a tangible link to Queensland’s early colonial life. The museum strives to present the stories of all who lived and worked here. Children generally do not visit historic houses willingly, and to address this OGH collaborated with Imaginary Theatre to develop an innovative and fun way to interpret and present the historical significance of the House to a younger audience. The result was a one-hour site-specific theatre performance, The Voice in the Walls — part game, part audio tour, part theatre. The key objective of the project was to create a visitor experience that captured the attention of nine- to twelve-year-olds by encouraging them to imagine an unfamiliar world and time while also conveying historical information. This article discusses the background to the development of the project, and its evolution from inspiration to practical reality. Abstract: Varying models of community engagement provide methods for museums to build valuable relationships with communities. These relationships hold the potential to become ongoing, dynamic opportunities for active community participation and engagement with museums. Nevertheless, the nuances of this engagement continue to remain a unique process that requires delicate balancing of museum obligations and community needs in order to ensure meaningful outcomes are achieved. This article discusses how community engagement can be an active, participatory process for visitors to museums. Research projects that utilise aspects of community-driven engagement models allow museums to encourage a sense of ownership and active participation with the museum. Indeed museums can balance obligations of education and representation of the past with long-term, meaningful community needs via projects that utilise aspects of community-driven engagement models. Using an oral history project at Historic Ormiston House as a case study,1 the article argues that museums and historic sites can encourage ongoing engagement through active community participation in museum projects. While this approach carries both challenges and opportunities for the museum, it opens doors to meaningful and long-term community engagement, allowing visitors to embrace the museum and its stories as active participants rather than as passive consumers. 344 pp., ISBN 9 7819 2552 2600, A$29.99. 9 7809 8743 2216, not for public sale. CSIRO Publishing, 2017, 208 pp., ISBN 9 7814 8630 7210, A$69.95. ISBN 9 7807 0225 9746, 87 pp., A$24.95.